I’ve really enjoyed reading everything by that the Madius guys are involved in (and that I’ve been able to wrestle out of the hands of our bossman Steve). From fiendish fishermen to silent samurai, vicious vikings to my weird crush on Average Joe, there’s been a huge variety of laughter and enjoyment to be had but this is the first time I’ve managed to get my hands on an issue from the Horrere series that Madius co-publish with Little O Productions, (yes, I won the arm-wrestling contest this time) so I was looking forward to seeing what their take on the horror genre was like. The Thin Place: Quite why they’re on a boat to start with, I’m not sure but that is by the way. 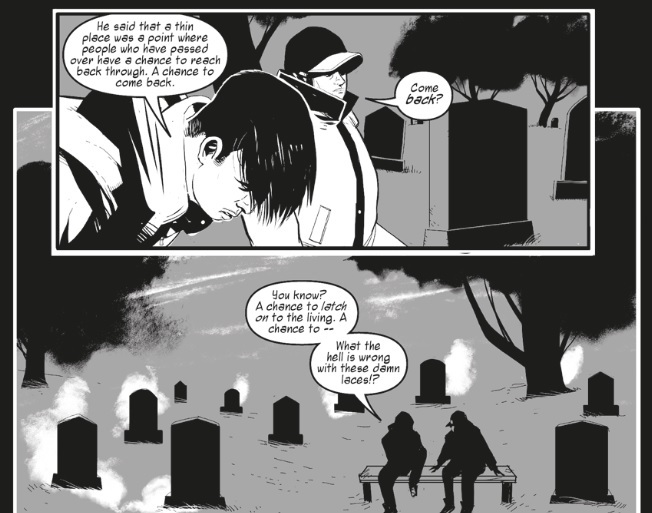 The premise of this story involves two young guys taking a short cut through the cemetery in order to get home before it gets dark. As they walk, one tells the other about stories he’s heard about the place from his now departed grandfather, about how this cemetery is a “Thin Place” where the spirits of the dead can come back through to the living. But this is just a ghost story... or is it? 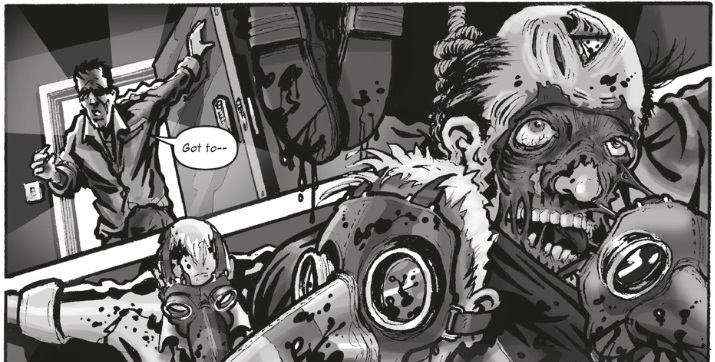 On first read through the thing that really struck me was the art by Neil Ford. The smudgy edges to the trees mingling with the gathering gloom in the sky was incredibly atmospheric and that was even before I started noticing the faces in the fog – superbly creepy stuff. There was a very clever use of panelling too to highlight expressions and add interest. Like the faces in the fog, the story crept unobtrusively into my mind, with details leaking out in the natural conversation between the two rather than everything being laid out obviously in flashbacks or visual cues. Couple this with a superb twist at the end and this is one of the best ghost stories I’ve read in a while. Tupper: This is the guest story so I was interested to see the real difference in approach and style. A group of adults and a child escape to a cabin in the woods because they are being chased by an unknown enemy. However, the enemy seems to be much closer to home as they try to work out how to survive there, with an added twist in the tale to give it a chilling edge. I enjoy psychological horror so this story started out well for me with growing suspense, confusion and tension from the unknown. The artwork also gave one of the best depictions of actual gore in black and white that I’ve seen for a while, the blood soaked squishiness was palpable. This story felt a lot more like a film storyboard than a comic to me though, as I got the impression that there was a lot more going on outside the visible panels which would flesh (no pun intended) the tale out, especially concerning who they were being chased by, and the twist was a little too obvious for me but enjoyable nonetheless. The Gilded Cage: The first thing I must say for this, my favourite of all the stories in this issue, is that the “voice” conjured up in the initial monologue by the psychotic murderer is scarily calm and realistic – the madness of Madius really has developed a sinister edge. I’ll not give too much away about the story because the first twist is right at the start and it just grows and twists and turns in on itself from there until it turns full circle – stunning stuff. The visuals were amazing too, the panels busy, close cropped and almost overwhelming but in a really good way that adds to the buzz of the terror. The use of a bird-like plague mask for the killer is inspirational and gives an added nuance to the title of The Gilded Cage as well as its more obvious inference. But the real genius in this is in the use of white writing on black for one of the voices giving it a depth of menace that could not have been achieved any other way. Bravo for that Mr Jones. 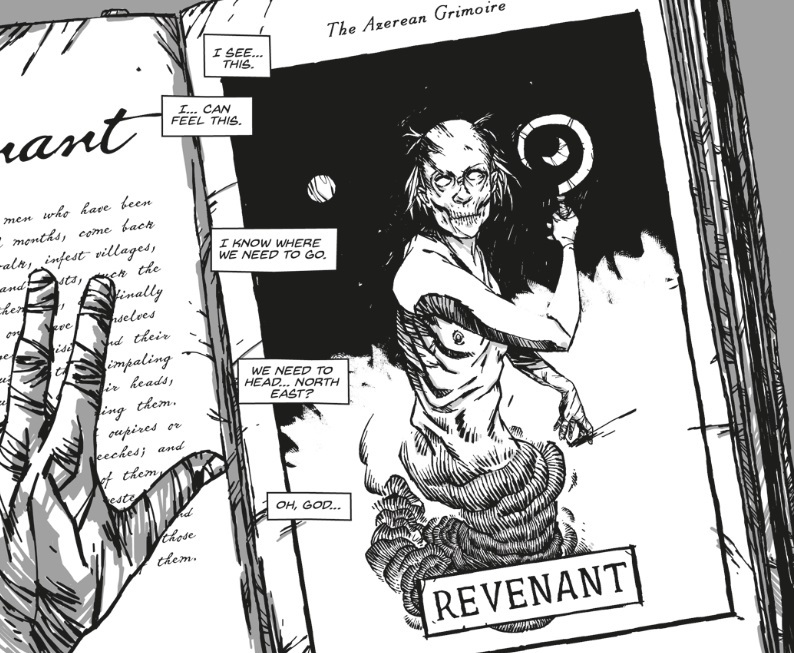 Grimoire Chapter Two – A Fish Out of Water: This is the continuation of the Grimoire story started in issue one but, since I didn’t get the chance to read the first one, I wanted to see how it works without knowing much of what had gone before. And the answer is – very well! The trademark Madius humour is back in some of the dialogue and makes for a very enjoyable read, even the Yiddish which made perfect sense on translation, and you really get the feel for the longer story arc without too much of a recap being needed. The art is again marvellous, especially in a dream/nightmare-like double page spread which I would have as a poster, there’s so much going on in it with the right level of “disturbing”. I’m looking forward to finding out what happens next as this story is continued again into the next issue. There are two more pages I want to mention, before saying how wonderful this whole comic is, and those are the front and back covers. The front cover art by MacEwan needs to be on a t-shirt or in a frame or something. Getting that level of freak into a monochrome image will take some beating – I can hardly stop staring at it while, at the same time, not wanting to look. Brilliant. And the back cover art by Dean Hopkins is quite simply beautiful. The pastel colours, the texture and the expression on that face evoke so much sadness and melancholy that you almost want to cry for him rather than run from him. So, yes, this whole comic really is wonderful. Full of scary, gory, suspenseful, horrifying enjoyment. 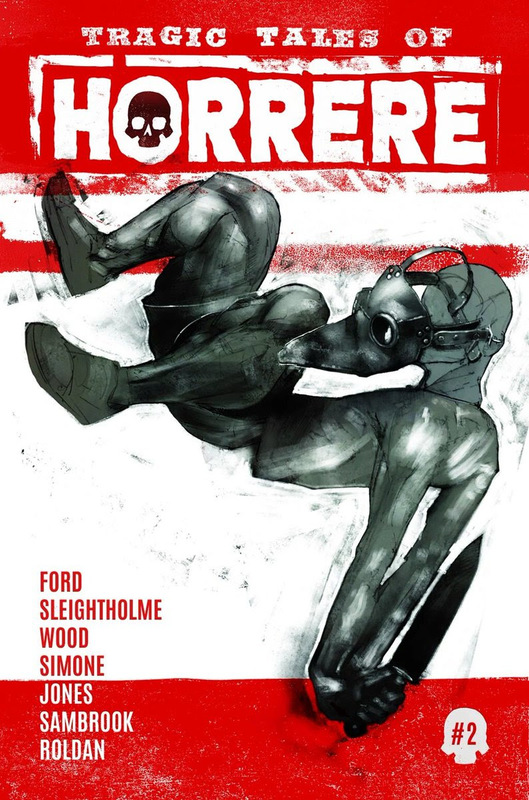 Horror fans, the only thing you won’t find within these pages is disappointment.